Cape May is such a beautiful place to enjoy a getaway vacation with your family and friends. The town’s charm and lazy, easy going style has solidified its reputation as a different kind of destination beach resort. One that places value on quiet walks, a beautiful environment, natural (and spectacular!) resources and unique activities for the entire family. One of the key things that helps to define your overall vacation experience is the place where you stay. If you’re traveling as a couple or small group, it’s easy to find an assortment of B&Bs or hotel rooms that can accommodate your needs. But what if you’re planning a trip with your entire family, or even a few families for a summer week, or fall weekend? How do you coordinate the logistics of where everyone will stay? Well, a vacation home rental can be the perfect solution to accommodate the needs of a big group or family vacation. And as we've seen over the years, staying in a vacation home can really add to the overall vacation experience. A Vacation Home rental (many people also call it a Guest House) is simply a private home that gets rented out in its entirety to a family or group of friends. When you rent a vacation home, you’re handed the keys, so to speak, and get use of the entire house. It’s a simple arrangement that provides many benefits to the vacation traveler. Comfort: You get to enjoy all the comforts, charm and space of a real home. Kids Included: Many B&B's don't allow children, so a vacation home becomes a great option if kids are part of the equation. Unique: Every home is different and adds to the vacation experience in a unique way. Privacy: Since you’re staying in a private home, you can enjoy the privacy that naturally comes with that. Some homes with yards provide a great way for the kids to burn off energy. You’re together: In a vacation home, you’re with your family, or group of friends. And so just like you would if everyone was staying at your own home, there’s a flow and rhythm to enjoying a house that you just don’t get when staying in a hotel room. You can cook meals together, watch a movie in the next room, or just hang on a front porch in a rocking chair and catch up while you take in the neighborhood flow. All these simple things can really make for a special experience that connects more deeply than staying in a generic hotel room. Great Value: Typically, with a vacation home rental, the cost per room is lower because the total house cost is spread over the entire group. So, for example, if a weekly rental costs $2,700 but there are 10 family members staying there, the weekly cost for each person is $270 ($2,700 divided by 10), and the nightly cost is about $39 ($270 divided by 7). Overall Experience: It can feel like you’re more connected to the local community. For example, many of the Vacation Home rentals in the historic district are old homes that have been there for a long time. How neat is that? To experience a town that’s known for its history and architecture by staying in a comfortable old home that has been a part of that history can really add to the overall vacation experience. 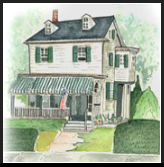 The above information provides a great overview on why a vacation rental can add to your Cape May vacation experience. We'll be adding additional tips and ideas that cover in more detail some of the fun things you can do to maximize the experience you have in a Cape May vacation home. Have any thoughts? Send us an email! And if you're a Cape May fan, don't forget to add your name to our totally private email list. We mail only a few times a year when we have fun, valuable information to share that can help you get the most out of your Cape May experience. Posted on October 5, 2010 by Michael.